NEWMAN: My group is a high energy physics group with a focus on the Large Hadron Collider (LHC) program that is about to start data taking at a higher energy than ever before, but over the years we’ve also had responsibility for the development of international networking for our field. So we deal with many teams of users located at sites throughout the world, as well as individuals and groups that are managing data operations, and network organizations like the Energy Sciences Network, Internet2, and GEANT (in addition to the national networks in Europe and the regional networks of the United States and Brazil). For the last 12 years or so we’ve developed the concept of including networks along with computing and storage as an active part of global grid systems, and had a number of projects along these lines. Working together with some of the networks, like Internet2 and ESnet, we were able to use dynamic circuits to support a set of flows or dataset transfers and give them priority, with some level of guaranteed bandwidth. So that was a useful thing to do, and it’s been used to some extent. But that approach is not generalizable in that not everybody can slice up the network into pieces and assign themselves guaranteed bandwidth. And then you face the issue of how well they’re using the bandwidth they reserved, and whether we would be better off assigning large data flows to slices or just do things in a more traditional way using a shared general purpose network. So I presume that’s where the interest in SDN came in? What’s happening with SDN is a couple of things. We saw the possibility to intercept selected sets of packets on the network side, and assign flow rules to them so we don’t really have to interact much with the application. There is some interaction but it’s not very extensive, and that allows us to identify certain flows without requiring that a lot of the applications to be changed in any pervasive way. The other thing is, beyond circuits you have different classes of flows to load-balance, and you want to prevent saturating any sector of the infrastructure. In other words, we want mechanisms so our community can handle these large flows without impeding what other people are doing. And in the end, once the basic mechanisms are in place we want to apply machine learning methods to optimize the LHC experiments’ distributed data analysis operations. Most advanced research and education networks in the last year or two have made the transition from 10 Gb/sec (Gbps) backbones to 100 Gbps; so people tend to say, “Wow, now you have lots of bandwidth.” But the laboratory and university groups in our field people have deployed facilities where many petabytes of data are stored, along with very large numbers of servers which are moving from 1 Gbps to 10 Gbps and in some cases 40 Gbps network interfaces. And 100 Gbps interfaces are expected within the next few months, so as fast as the core networks progress, the capabilities at the edges are progressing even faster, so this is a real issue. The LHC Computing Model was originally a hierarchical picture that included a set of “tiered” facilities. 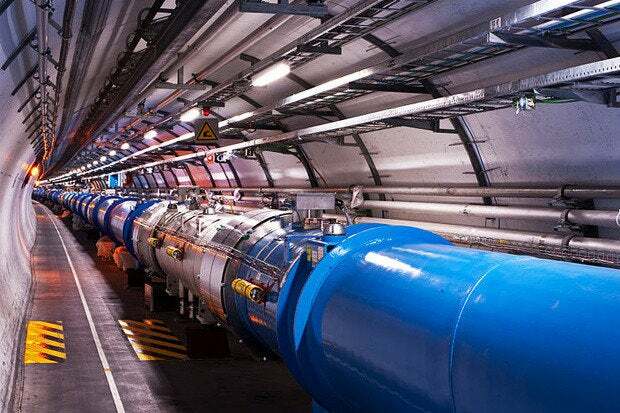 We called CERN the “Tier 0” where the data taken at the LHC are first analyzed. There are now 13 Tier 1 centers, which are major national computing centers including centers at the Fermi National Accelerator Laboratory (Fermilab) and the Brookhaven National Lab (BNL) in the US. Right. Data is taken by the experiments, processed for the first time at CERN and then distributed to the Tier 1 centers via a sort of star network with some dedicated crosslinks for further processing and analysis by hundreds of physics teams. Once the data is at the Tier 1s it can be further distributed to the Tier 2s and Tier 3s, and once there, any site can act as the source of data to be accessed, or transferred to another site for further analysis. It is important to realize that the software base of the experiments, each consisting of several millions of lines of code, is under continual development as the physics groups improve their algorithms and their understanding and calibration of the particle detector systems used to take the data, with the goal of optimally separating out the new physics “signals” from the “backgrounds” that result from physics processes we already understand. ESnet’s dynamic circuits, which have been in service for quite a while, are called OSCARS. There is an emerging standard which is promoted by the Open Grid Forum called NSI, and we’ll integrate NSI with the application, so that’s one upcoming milestone for the LAT ONE part of this picture. One might ask, “What sets the feasible scale of worldwide LHC data operations?” Two aspects are the data stored, which is hundreds of petabytes and growing at a rate that will soon reach an Exabyte, and the second major factor is the ability to send the data across networks, over continental and transoceanic distances. Then apart from the high throughput and dynamic changes at Layer 1, one of the main things was to be able to show software-defined networking control of large data flows. So that’s where our OpenFlow controller, which is written mainly by Julian, came in. We demonstrated dynamic circuits across this complex network, intelligent network path selection using a variety of algorithms using Julian’s OpenDaylight controller, and the ability of the controller to react to changes in the underlying optical network topology, which were driven by an SDN Layer 1 controller written by a Brazilian team from the university in Campinas. The exercise was a great success, and one that we hope will show the way towards next generation extreme-scale global systems that are intelligently managed and efficiently configured on the fly. We’re progressing well, and expect to go from testing to preproduction and we hope into production in the next year or so. After Supercomputing in 2014, we set up a test bed and Julian has started to work with a number of different SDN-capable switches—including Brocade’s SDN-enabled MLXe router at Caltech and switches at other places. So we’re progressing and we expect to go from testing to preproduction and we hope into production in the next year or so.